I have only recently written about a NuBo facial, so on this occasion I am going to talk to you about the tips that I learnt from NuBo’s facialist Jana and the area all ladies should start paying attention to-our necks and decollete. Having a facial at 10am is not uncommon for some of my girlfriends but it was the first time I had one that early in the morning when not on a holiday. Jana, looking very pretty in her chic and immaculately white therapist’s top, which wouldn’t look our of place at a chic soiree (a lady should always pay attention to her appearance was what my grandmothers and mother used to drum into me with various degrees of success) let me get comfortable on the bed at Fenwick’s treatment room and proceeded to give me the facial, which on this occasion was a combination of a facial, neck and decolette treatment, as well as mind relaxation and scalp massage. The first tip is to do a ‘double’ cleanse of your face with a muslin cloth , followed by a mini facial brush. It feels luxurious but also gets rid of the dead skin cells, brings oxygen to your skin and speeds up cell regeneration. When your skin is more mature it might mean that if you use Vitamin A in your skincare (and it needs to be prescribed by a dermatologist ), you might need less of it. Secondly, do not underestimate the importance of the face massage ( it is good for your skin, for your muscle tone and it relaxes you as well ) and combining it with a neck and scalp massage. People who work at desks and with computers often tend to accumulate tension in their necks and shoulders, thus restricting blood flow to the brain, so by massaging your neck, sideways and at the back, will help you feel less stressed and more clear-headed. Jana did wonderful side stretches of my neck and worked out the knots, making me feel more relaxed almost instantly. Sculp massage also improves the blood flow to hair follicles, thus leading to your hair looking shinier and healthier as well, if you do it on a regular basis. Thirdly, massage your jawline in the morning and in the evening by sliding your fingers from the cheekbone downward and then across the jawline, dissolving away the tension and helping you skin to detox. When done regularly, it improves the contours of your face and makes your face look more defined. When Jana applied NuBo’s Oxygen Boost (unlike many ‘oxygenating’ products on the market that contain hydroxy peroxide, this one doesn’t thus magnifying oxygenating, healing effect by delivering oxygen directly to the skin cells. It has a light texture, similar but not exactly like a gel and sometimes I prefer to use it instead of primer before applying my make-up, especially when my skin looks a little dull or tired) to my skin before the exfoliation I was a little puzzled but, here goes another tip, applying an oxygen boosting serum to the skin after cleansing but before exfoliation helps to hydrate the skin and revitalise the cells on a deeper level. Many women (and men) just rub their eye cream in, not realising that they render the product ineffective and possibly leading to big under eye bags later in life. Instead, tap your eye cream around your orbital bones and don’t be afraid to massage your eye area, again, following the orbital bones, doing a gentle pinching action along the way. When I came out of the treatment room I swear my under-eye shadows were less visible and I was make-up free. Now, the latest innovation from NuBo ( that is one of the things that I really appreciate about the brand, the team doesn’t rest on its laurels and continues to evolve all the time ), is not just their new neck and decollete protocol, being showcased during their facials at Fenwicks this week, but also the new neck/decollete mask that feels like a thick & luxurious cashmere sweater that you put on in the evening after spending the whole day on the pists. When Jana took it off, in one swift movement, I could feel that the area was smooth and plump without even seeing it. 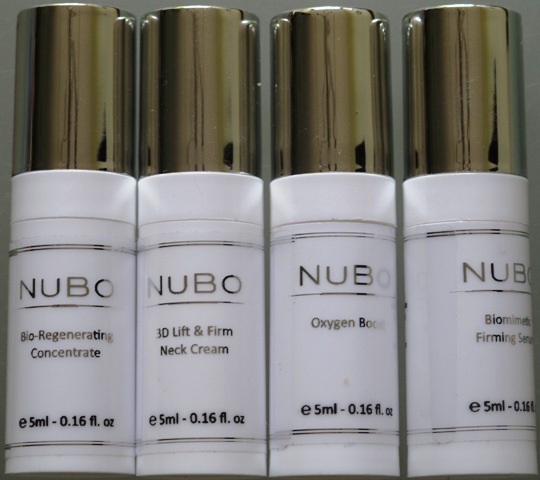 I am positive that it will greatly benefit women with a slightly more mature skin but that is not to say that younger women shouldn’t start looking after that area as well, hence NuBo’s new addition to their body product range called 3D Lift & Firm Neck Cream that helps to re-contour neck and decollete. It has a pleasantly gentle smell and feels very nourishing upon application, tightening and lifting the skin. Women who have gone through pregnancy and nursing their babies will also find this product quite beneficial. The ultimate pleasure in life stems from the balance between you mind and your body, making for a truly happy and balanced person. I walked out of the treatment room feeling like Julia Roberts in the Pretty Woman scene where she is wearing an off the shoulder scarlet evening dress and being flown over to the opera. My mind was relaxed, so much so I had trouble stringing words into sentences. My skin glowed, my shoulders weren’t hunched, my neckline felt rejuvenated and my mind was at peace with the world.